The NICE Lyme disease guideline has now been published and can be accessed here. LDUK commented extensively on the draft guideline, labelling it as ‘an inadequate tool for doctors and patients, seriously undermined by lack of evidence’. Our comments can be found here. The usefulness of the guideline is therefore called into question, with cause for concern over patients being under-treated, undiagnosed or misdiagnosed. We desperately need new research into better treatment protocols as the current treatment on offer is based on limited and outdated research. LDUK is pleased to note that some of our stakeholder comments on the draft NICE guideline have been incorporated into the final version and acknowledges the following positive aspects. Raise awareness of Lyme disease. Make it clear that patients should be treated straight away if an EM rash is present, without the need for testing. Make people aware of the fact that testing too early can result in a negative result (it can take approximately 6 weeks for antibodies to form). Make people aware that Lyme disease treatment can trigger a Jarisch-Herxheimer reaction and that this doesn’t necessarily mean treatment should be stopped. Prevent people from becoming chronically ill if they are treated promptly. People infected this year will now be able to access two courses of two types of antibiotics. Enable Lyme disease patients to access social care more easily. Encourage funding to go into research to plug the huge holes in the evidence base on which they are built. That ticks are found in urban parks and gardens and not just in regional hotspots or abroad. The limitations of Lyme disease testing. The importance of clinical diagnosis based on symptoms, signs and patient history as blood tests are not a reliable tool to be used in isolation for diagnosis. The possibility of other tick-borne infections being responsible for symptoms. That more follow ups/reviews with patients should take place. The guideline states that ‘most people recover completely’. This is highly misleading and based on the experiences shared in our Online Community, it is simply not the case. This statement affects the way both doctor and patient see the severity of Lyme disease and fails to acknowledge that some people never recover and are disabled. What is meant by ‘most people’ in this statement is not defined. The outcomes that the guideline committee judged to constitute “complete recovery” are not stated and neither is how long the recovery needed to be maintained for to be considered “complete”. Impact on patients with long term symptoms: The guideline is ‘evidence based’, however there is a large and growing population of patients suffering from progressive and debilitating symptoms whose situation will not improve as a result of this guideline. Many are never treated promptly following a tick bite or an EM rash and chronic illness sets in which appears to be much more complex to treat. The guideline states that it may take ‘months or years’ for symptoms to resolve after treatment and that symptoms may be a result of ‘permanent damage’ from Lyme disease. Assessing which symptoms should resolve in time and which are due to permanent damage is problematic. There is no test to tell us when the infection has been successfully eradicated and when further treatment is or is not needed. There is no guidance on treatment for patients who aren’t treated promptly and no exploration of complexities added by other coinfections or different bacterial forms. 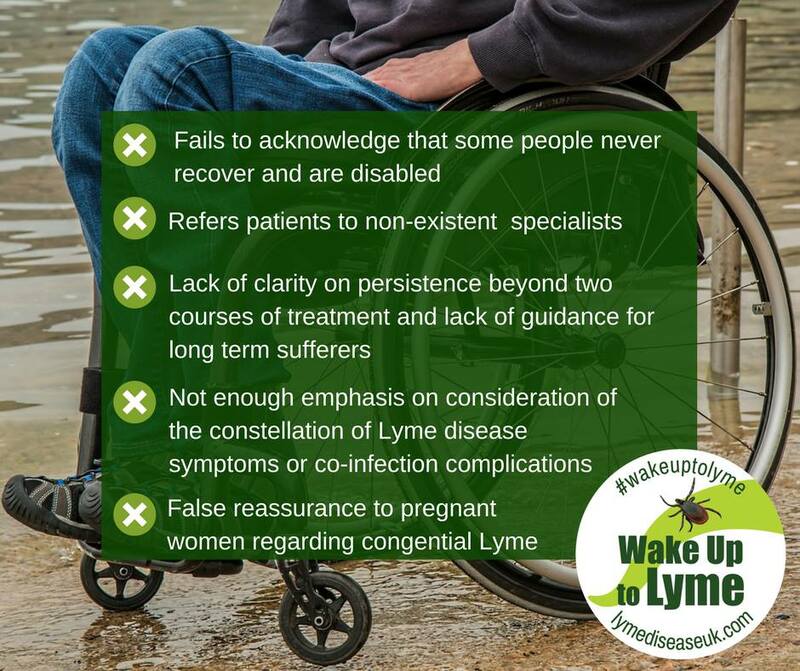 The guideline frequently states that patients should be referred to specialists whereas the reality is, there are no Lyme disease specialists within the NHS. There is an acknowledgment that treatment for Lyme disease may fail and that the infection can persist between a first and second course of antibiotics but then there is a lack of clarity on persistence beyond two courses of treatment. There is no test that can tell us when the infection has been successfully eradicated and the evidence base for current treatment protocols is poor. There is concern that people may be written off after two courses of treatment. Lyme disease is described as an uncommon cause of certain symptoms. We are concerned that emphasis is not placed on the fact that when this constellation of symptoms occur simultaneously, Lyme disease may be a common cause. False reassurance may be offered to mothers about the risk of congenital Lyme disease being ‘very low’ when more research is needed in this area to back this up. Specialist clinics(s) need to be opened so that NHS doctors can have the opportunity to learn from those with experience in treating Lyme disease. Currently, many patients are turning to private practitioners both in the UK and abroad. The Government needs to ensure that funding is made available urgently as research needs to be fast-tracked as soon as possible and to recognise that people need help in the meantime. A reliable test must be established as well as effective antibiotic protocols which successfully eradicate the infection. Other routes of transmission need to be researched as well. It is not acceptable that patients are left to self-treat or pay to see private practitioners either in the UK or overseas in order to regain their health and quality of life prior to being infected. Doctors around the world who are open minded and attempting to help those who are chronically ill with Lyme disease have reported their licenses being under threat for attempting to alleviate suffering. In such an under-researched area of medicine, licensed medical doctors with success in treating Lyme disease should be allowed to use their experience without prejudice and fear, especially in the absence of any other help on offer. These doctors may be able to provide valuable contributions in the training and research arena. Until there is a better test and until more is known about how to treat patients who were never treated initially and who have ongoing symptoms beyond the treatment on offer, both the limitations and the positive aspects of the guideline need to be clearly communicated to health professionals and patients. Without careful explanation, this guideline is at risk of reinforcing the widely held misconception that Lyme is easy to treat and that long term symptoms are not due to persistent infection. The guideline also risks fuelling the stigma surrounding those patients who do not feel they have been adequately treated for Lyme disease as well as any doctors who agree with them. WHAT WILL LDUK BE DOING IN RESPONSE TO THE GUIDELINE? Draw medical, political, public and media attention to both the useful and problematic areas of the guideline, in order to raise awareness and help dispel widely held myths and misconceptions about Lyme disease. Patients with long term symptoms will continue to be stigmatised unless medical professionals understand the far-reaching uncertainties and limitations of the evidence base on which the guideline is based. Create a patient ‘guide to the guideline’ to ensure that patients can utilise relevant information successfully to secure early treatment. Draw medical, political, public and media attention to the lack of treatment options available for patients who were not diagnosed and treated immediately after being infected and who are now chronically ill. 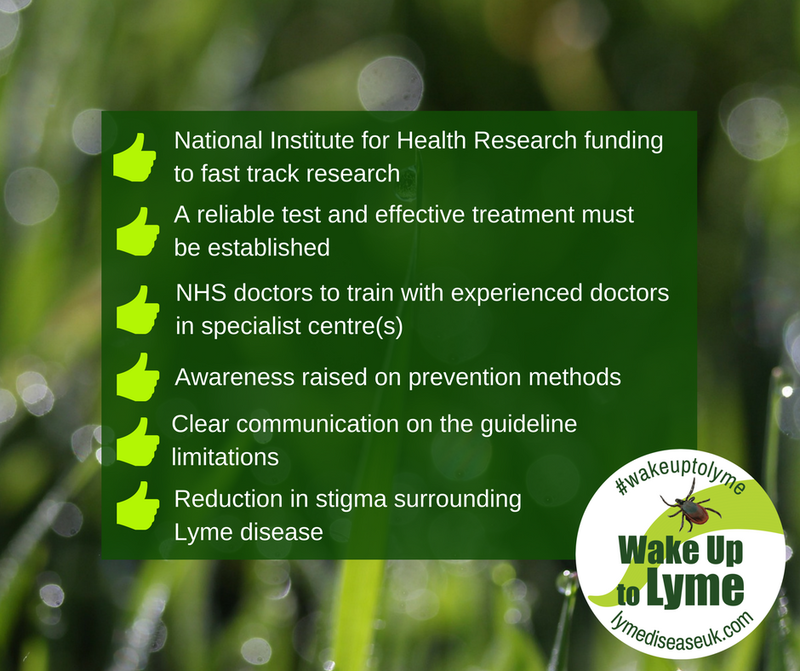 Assist the Lyme disease All-Party Parliamentary Group in any way possible, pushing for fast-tracked research and courses of action to help those who will be failed by the guideline. Continue to raise awareness nationally to reduce the number of people with new infections being left undiagnosed, misdiagnosed and untreated. Continue interviewing international Lyme disease experts to make people aware of different perspectives and treatment approaches. See our interview series here. Continue to provide support in our Online Community to help people navigate their way through this complex illness. WHAT CAN YOU DO TO MAKE YOUR VOICE HEARD? Tell us what you think by filling out this LDUK survey which closes on 30th April 2018. We want to hear your views on the guideline. All comments may be used anonymously for campaigning purposes (media, website, meetings, events) and by submitting the survey you are giving permission for your comments to be used for this purpose. Write to your MP and draw their attention to the positive and negative aspects of the guideline. Ask them to become a member of the Lyme disease All-Party Parliamentary Group if they are not already. The APPG’s website can be found here. Make your GP aware of some of the popular myths about Lyme disease which have now been addressed by the guideline (e.g. that Lyme disease can be found in urban parks and gardens and not just in rural hotspots, that blood tests aren’t foolproof and that treatment failure can occur after a single course of antibiotics and that evidence on treatment protocols is very weak and outdated). It’s also important to point out the overall guideline limitations and poor evidence base on which they are built. Take a photo/short selfie film of your story and we can consider uploading to our YouTube Channel and to share on our website and social media channels. 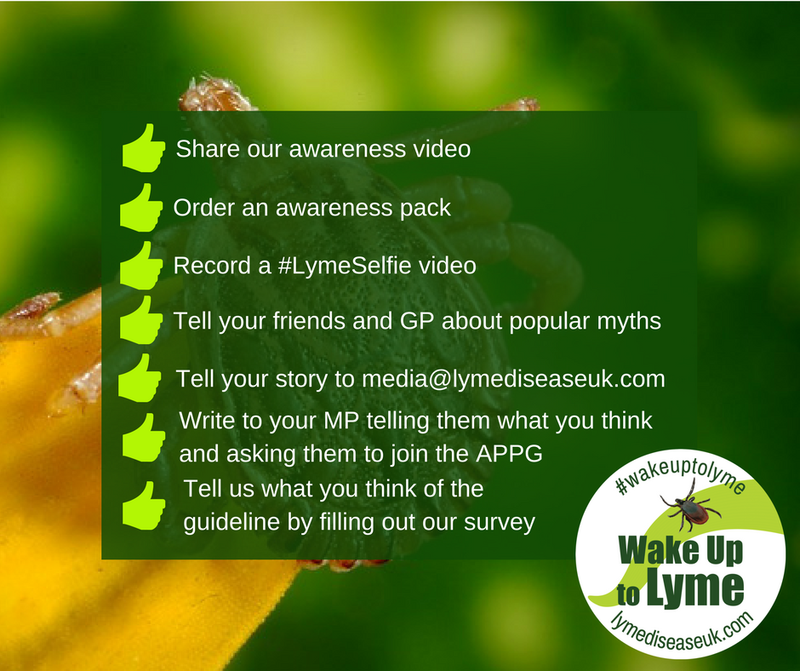 Please email your clip to admin@lymediseaseuk.com and share your videos on your own social media and in our Online Community Group if you’re comfortable doing so (using the hashtag #LymeSelfie). Hold your camera landscape (so the shot is longer than it is high), talk straight to the camera about your personal experience and please keep your video to under 3 minutes. 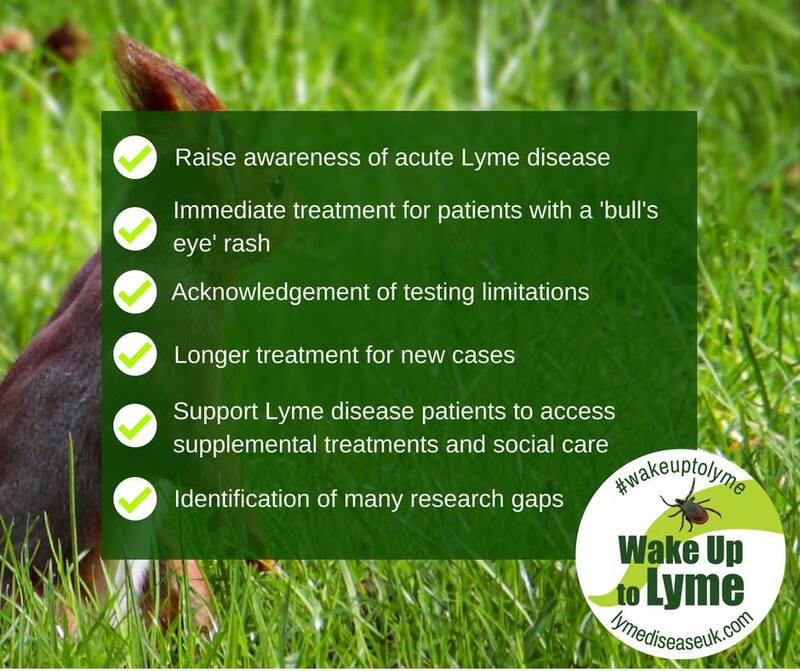 Order a ‘Wake Up to Lyme’ awareness pack by filling out this form. Packs are free for UK residents and contain posters, car stickers, tick awareness cards and leaflets to distribute in your local community. 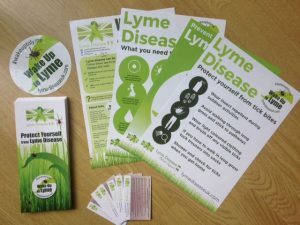 If you are planning on holding an awareness event in your community, please email admin@lymediseaseuk.com and we can also send you stickers/balloons/insect repellent samples/collection box.